We have seen plenty of coverage recently about the upcoming release of Firefox 3. A lesser known fact is that this release is accompanied by a new Firefox add-ons site and is right now available for preview here. I for one love it’s clean look and pleasing colors. They have done some nice changes to the layout as well as usability. A prominent search box in the home page with options to look up by categories. Great for quickly finding the extension if you already knew it’s name. ‘Themes’ has been replaced with ‘Interface Customizations‘ in Categories. One you click on it, you can still browse themes by different categories in it. Extension single-page is now neatly laid out showing tags, pictures & reviews. Also, I like the way they have moved the review box to above-the-fold placing. Nice integration of sandboxed add-ons – show up right beside the others with a ‘Experimental‘ tag. A great way to find newer extensions that haven’t made the cut yet. The changes are nice so far but the site is far from perfect. Of course, they warn us that it is in testing but not sure if this version will have much needed things like ability to sort by rating or number of downloads or Firefox version supported or last updated date etc after a search. 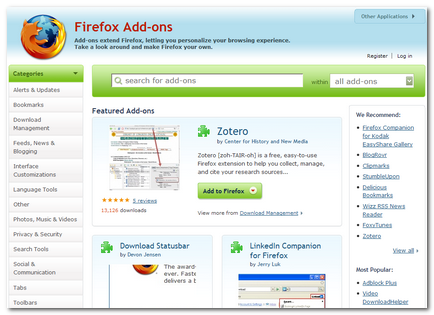 In fact, ability to be able to quickly find Firefox add-ons by the version of Firefox has to be one of the most common gripes about the Add-ons site. Overall, it is a great improvement to the current site but still a work in progress. Mark’s last blog post..Today Is The Last Day To Enter! Nirmal.. yep! Isn’t that cool? Wow, that should be interesting to watch out for. But in FF3, I guess you’ll be able to search, browse and download addons from the addons window itself, without going to the addons site. Then what’s the purpose of redesigning the site now? Correct me if I’ve got something wrong. Hey Shankar.. good question! If you’ve seen the Add-ons search interface, it is rather minimal and limited. It’s good for quickly finding and adding ones you already know but I think the site would do a better job at letting you browse through various categories and stumble across new ones. Plus, the add-ons site also caters to other apps like Thunderbird, SeaMonkey & Sunbird.